What is the Texas Project WILD Suite? As our planet grows more crowded every day, natural and wild places are rapidly diminishing . . . and so is wildlife. Project WILD explores how people can understand wildlife and habitat and make decisions that use natural resources wisely. Who can use Project WILD? The Curriculum & Activity Guides are at the heart of each workshop. 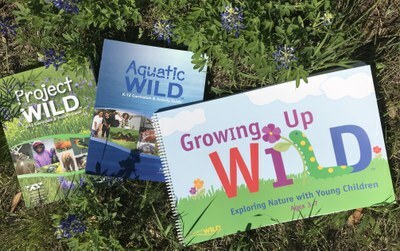 Project WILD K-12 Curriculum & Activity Guide contains 122 activities concentrating on terrestrial wildlife, habitat and ecological concepts. Aquatic WILD K-12 Curriculum & Activity Guide contains 48 activities emphasizing aquatic wildlife and habitats.. Growing Up WILD is an early childhood education program that builds on children's sense of wonder about nature. systems and responsible human actions. Each guide also includes quick-reference indices as well as a glossary of terms. Was written by classroom teachers and other educators, university faculty, resource agency personnel, representatives of private conservation groups and other community representatives. Was extensively field tested and evaluated for student achievement. The program continues to be monitored and evaluated with changes made to the materials to respond to educator feedback and incorporate new information. The National Environmental Education and Training Foundation in Washington, D.C.: (CEE) National Environmental Education Achievement award for leadership in conservation education. Consistent with recommendations of the National Science Teachers Association. See Project WILD activities in action and listen to comments from a host of educators.